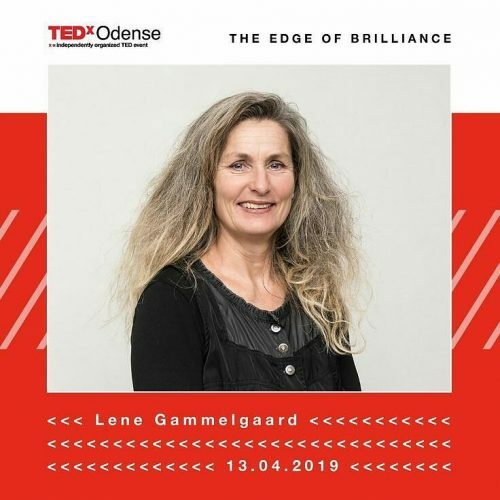 BOOK LENE GAMMELGAARD – acquire the EVEREST method to innovate sustainable business – beyond status quo. Sustainability - A trying nuisance or an incredible once in a lifetime opportunity? How can we innovate leadership and self-responsibility - to expand sustainable business development in the fourth industriel revolution? Do you and your company mobilize a live-able future through your actions today? ARE YOU INNOVATING A LIVEABLE FUTURE IN I4.0? The Everest Way is a unusually effective and mobilizing simple approach to the psychology of corporate transformation. FUTURIZE THE EVEREST WAY is a method to innovate processes that makes change management and sustainable leadership more effective. Drawing on a wide range of scientific, societal and psychological sources, Lene brings it all together in highly comprehensible method – FUTURIZE THE EVEREST WAY – unlocking resistance to change by mobilizing stimulating transformation through human innovation. Lene offers a mental method to how companies can transform – “giving people a meaningful reason to change. When I said YES and committed to want to climb Mount Everest in 1996 – something happened in my brain. I can only describe IT as a quantum-leap explosion. I experienced the neuro-transforming effects of wanting something – enough – and discovered the science Neuroprogramming – the most transformative investment that you can make towards progress – today. WE CAN INNOVATE THE FUTURE – DO YOU? Sustainability is a macrosocial challenge that concerns us all. ARE YOU AND YOUR ORGANIZATION COMMITTING TO IMPROVING THE STATE OF THE WORLD? Whether it be individual challenges or gigantic economic potentials: sustainability means more than just reducing energy consumption, circular economy and efficient use of resources. Fair sustainability is the principal task of the future – faced by organizations and societies as a whole. Tremendous commercial potential is linked, for better or worse, to effectual sustainability. 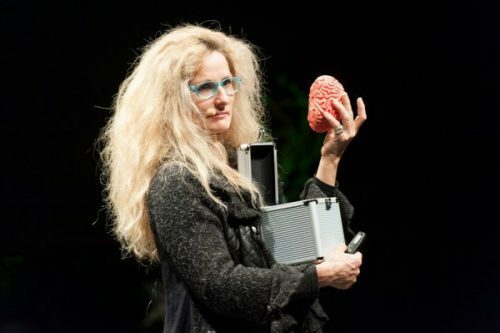 In Lene Gammelgaard – Human Innovation – we aim to deliver truly innovative and life-changing mental methods for our clients to innovate company missions that mobilize people who lead into the Future. FUTURIZE THE EVEREST WAY will lead the way. Lene Gammelgaard’ inspiration is the unique unifying mission of the 17 world goals. FUTURIZE THE EVEREST WAY to achieve what has never been accomplished before mobilizes an individual reflection process. The results can be used directly in your business practice and innovates the future. Your brain is the GPS. FUTURIZE THE EVEREST WAY is 1 of the world’s most efficient transformation methods. A brain stretched through new thoughts and experiences – can never shrink to its previous base-line. Your return of investment is our 1 concern. Our mission is to mobilize global collaboration through expanding focus on the discovery, the development, and the commercialization of processes for development of leaders and the entrepreneurial employee of the future workforce mobilized by SDG. ARE YOU COMMITTING TO IMPROVING THE STATE OF THE WORLD? Our world is changing – the reality is that our present and future offers expanded business opportunities through the inventions that contribute – to improve the state of the world. FUTURIZE THE EVEREST WAY – is a simple method for ALL to achieve what has never been possible before. The 4 industrial revolution transforms us and the business world. 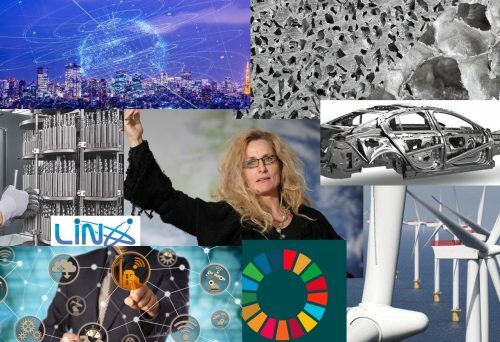 UN’s 2030 global goals for sustainable development – SDG – will have a massive impact on – WHAT – WHY and HOW we innovate in the fourth industriel revolution. The 17 Global objectives must be in focus when choosing the direction of robotics development and digitalization. 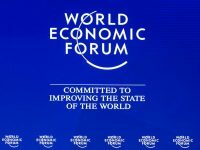 The World goals will permeate the awareness of business partners, consumers, customers, employees, countries and markets, and offers a genuine opportunity for individuals, businesses and organizations to pursue sustainability as mental drivers when we transform to innovate existence justification in I4.0. FUTURIZE THE EVEREST WAY mobilize individuals for leadership in an increasingly complex and ambiguous world. Individuals who constructively impact difficult and solution craving challenges. Innovate sound long-term business missions. As well as pursuing a work/life that is worth living. FUTURIZE THE EVEREST WAY mobilize dynamic, engaged and driven individuals – on all levels – who possess a high degree of curiosity and service-oriented humbleness. Agile progress entrepreneurs with a profound sense of purpose – regardless of the scale and scope of the challenges we face. Mobilized through the visionary matrix of personally innovating viable business opportunities by contributing to accomplish the 2030 Global Goals for sustainable development. Do you MOBILIZE BUSINESS OPPORTUNITIES WITH THE SDG IN I4.0? STATUS QUO – the conception that technology and digitalization is THE solutions to economic and sustainability leapfrogging – characterizes prevailing rhetoric – but mesureable life-enhancing results are still scarce. Innovation is imperative for a growing number of companies, leaders, entrepreneurs and organisations.Technology can be a vital tool for sustainability and prosperity – when innovated and allocated with focus on ROI – the return of investment – that it must improve the lives of people, not complicate, bureaucratizise or alienate. 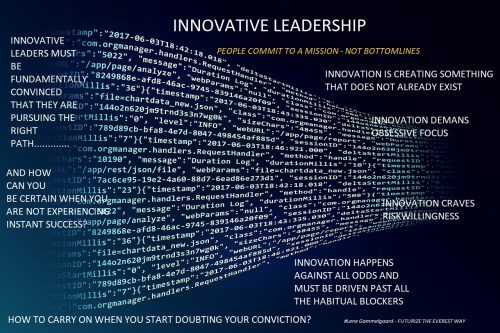 Innovation of technology and digitalization hypes – novel solutions – Innovations that will only add value to our lives – if we focus on HUMAN INNOVATION. Contemporary research uncovers that result-producing innovation capabilites are feeble. For pioneering sound thoughts to survive – from idea to commercialization – a number of factors are fundamentally important. The ability to conceive, embrace and endure disruptive ideas, cope with entrepreneurial risk, unifying diversity across workforces and innovate flat none hierarchical structures in companies. Expansion of resilient – agile HUMAN INNOVATION is crucial to utilize the 4th Industriel Revolution for the greater good of Humankind. Today just 1 in 10 leaders succeed in mobilizing their workforce. More than 65% leaders do not think they have sufficient skills for the transformations in the next 5 years. FUTURIZE THE EVEREST WAY – because we are venturing into the unknown and we need to develop people who lead the future and drive business awareness and action in support of achieving the Sustainable Development Goals by 2030. Leadership is the ability to transform compelling missions into engaging goals. To influence and mobilize other people’s behavior – so plans for what we want – transform into tangible results. The processes from how visions are developed – until we actually achieve what we strive for – and the personal relationship between the leader and those who must do the work – is decisive. I4.0 LEADERSHIP – and self-leadership is an evolving agile problem solving adaptation – as well as risk willing future oriented process. Innovation and mobilization of management skills in people – that want to lead into the future – are crucial to the survival and success of companies and organizations in I4.0. ARE YOU MOBILIZING A FUTURE WORTH LIVING ? FUTURIZE THE EVEREST WAY KEYNOTES are mental methods for developing, pursuing and implementing visions of a desired future. And modus operandi to how we adapt to the rapid pace of change – risk tolerance – without existential fear of what to expect. FUTURIZE THE EVEREST WAY – Keynotes, lectures, presentations, base-camps and transformation programs – innovate missions, leadership, organizations and people who accomplish what has never been achieved before. When you invest in Lene Gammelgaard – you are invited to contact her throughout the process of implementing your business version of FUTURIZE THE EVEREST WAY. At LENE GAMMELGAARD – HUMAN INNOVATION – we aim to deliver truly transforming mission innovation programs for and with our clients. Our mission is to expand sustainable agile innovation in you and your organization. Our vision is to contribute to global collaboration through the discovery, the innovation and the commercialization of methods to expand human capacity to drive substantial transformations in the 4th industrial revolution in compliance with the 17 Global Sustainabilty Goals. FUTURIZE THE EVEREST WAY are simple – profoundly effective processes for individuals, social entrepreneurs, managers, leaders and entire organizations to drive adaptive innovations – from vision invention to buttom-line results. LEADERSHIP RESEARCH over the last 20 years shows that max. 20% of companies that initiate change processes have achieved profound transformations. And that just 1 – 10 leaders motivates employees to utilize their full potential. BOOK: FUTURIZE THE EVEREST WAY – to circumvent status quo and innovate missions and leadership to accomplish what has never been achieved before. Mobilize people who lead into the Future of I4.0. Bio Lene Gammelgaard: Prominent sustainable leadership speaker & bestselling author. Innovator of Futurize The Everest Way – A mental method to accomplish what has never been achieved before. Specializes in mobilizing people in organizations to innovate immediate action with focus on SDG – UN’s sustainable development goals. Lene combines her intellectual aptitude with hard won experiences from high altitude mountaineering – into mental strategies supported by cutting-edge neuro science. Lene has a background in extreme adventure and became the 1. Scandinavian woman to summit Mount Everest May 10 1996. Lene has a law degree, is a journalist as well as psychotherapist. Speaks English, German and Danish on conference level. We are altered by the world's largest transformation since the first industrial revolution in the 18th century. The 4 Industrial Revolution (I4.0) is a exponential fusion of technologies that erase the boundaries between the physical, digital and biological. The 4 Industrial Revolution is characterized by technological breakthroughs in a number of areas, including robotics, artificial intelligence, digitalization, nanotechnology, quantum computing, biotechnology, the internet of things, cloud computing and cognitive computing, 3D printing and autonomous vehicles. The 4 Industrial Revolution transforms most industries - in all corners of the globe. The speed and scope of innovations dictate the rethinking of entire production systems, human resources, management and global policies. The overwhelming array of trends, mega shifts and connectivity - requires the individual to reflect and take responsibility to innovate a viable future - with focus on liveable lives for HUMANS. Today’s existence is an accelerating complex mix of risks and opportunities. Individuals are better informed and interconnected than ever before – and people want businesses to take their share of responsibility for the state of the world. There is an expanding awareness that companies ought to concern themselves with long-term sustainability. The businesses that innovate now - will be a step ahead. We must transform the global goals into personal missions. FUTURIZE THE EVEREST WAY is a catalyst for human innovation. A PROJECTION OF A DESIRED FUTURE - MOBILIZES FROM DAY 1. Gallup RESEARCH of the last 20 years performance in organizations, measured the engagement of 27 million employees at more than 2.5 million work units. Gallup estimates that leaders and managers account for at least 70% of the impact on employee engagement scores across business units. This influence is responsible for severely low worldwide employee motivation. Harvard Business Review studies find that particularly senior executives display an unwillingness to think rigorously about innovating their world perspectives and their ideas of how organizations are managed and transformed. Which poses an inbuilt risk for hampering employee commitment to utilize the infinite, risk demanding opportunities of the 4th Industrial Revolution. Worth pondering -while over the past 12 years, these low numbers have barely budged, consequently the vast majority of employees worldwide are failing to develop their ressources and contribute through work. ENGAGEMENT is the SOLUTION – The comprehensive GALLUP findings concludes: When a company raises employee engagement levels consistently across business units – EVERYTHING improves! FUTURIZE THE EVEREST WAY – provides simple mental methods that explode habitual limitations to venture into the unknown. FUTURIZE THE EVEREST WAY – innovate mobilizing organizational missions and cultures that unify talented employees who achieve what has never been accomplished before. What if I told you there was something that you and your employees can do right now that would have an immediate, positive benefit for your business prospects including the overall collaborating culture in your organization? I am talking about the powerful effects of disciplining the brain. I want to share my story about how I came to my experiencebased understanding of neuroleadership. I invented an experiment with myself in which I discovered the science underlying the most transformative step that you can take for your progress – today. Neuroprogramming has immediate & long-lasting benefits for the rest of your life. When I said YES and committed to want to climb Mount Everest in 1996 – something unprecedented happened in my brain. I can only describe IT as a quantum-leap explosion. I experienced the neuro-transforming effects of wanting something – enough. When I said “YES” to Scott Fischer‘s question – Do you want to climb Mount Everest with me? – the first thing I thought was: “I can not!” and I was exposed to my deepest anxieties of not being capable…. And then there was a quantum leap explosion in my mind – that mobilized resources – I was not aware that I had. I became mobilized from deep within – I became INNOVATED. I was simply mobilized to innovate EVERYTHING – that was needed to make THE COMPELLING VISION of scaling MOUNT EVEREST with like minded people – come true. Starting with that I had to fool myself into believing that – I would be able to accomplish something, I did not have evidence for I could. Nothing could stop me from reaching the top of the world’s highest mountain. I invented unorthodox methods to optimize my limited resources – and developed my mental programming – To the Summit and Safe Return – that supported my climb and maybe helped me survive where others died. On Mount Everest I internailzed agile human innovation through every single step. I had to adapt to the future as it revealed itself and progress towards accomplishing TO THE SUMMIT AND SAFE RETURN. What was mobilized in me – has been a groundbreaking and sustained enrichment. Therefore, I have dedicated my life to researching and developing HUMAN INNOVATION. I turned myself into a human gunniea pig – experimented with my brain without knowing the actual effects. And I invented THE EVEREST WAY it in a completely inadvertent way. Committing ALL towards Everest was changing my brain. I encountered something that was so amazing, with the potential to change so many lives, that I have dedicated my life to share and expand IT. I am passionately dedicated to HUMAN INNOVATION – THE EVEREST WAY. THE EVEREST WAY explodes all inner and outer limitations – and expands future opportunities. Today Neuroscience uncovers more and more about the most complex structure known to humankind. Our Brain. The more I learn, the more research supports what I experience myself – how powerful the human hard drive – our Brain is. Taking charge over our own brains has the potential to transform so many lives. We are forced to innovate leadership – so more leaders become capable of mobilizing people who lead into the unknown of the 4th Industrial Revolution. FUTURIZE THE EVEREST WAY works – and it’s free! We can commit to improving the state of the world - One Brain at the Time! THE EVEREST WAY mobilize measurable results. In individuals and throughout – Global companies. THE EVEREST WAY gives responsibility for the future to the people who will live with the consequences. FUTURIZE THE EVEREST WAY revitalizes – and mobilize collaboration – also across cultures and borders. NEURO LEADERS SHIP is for the entire organization from bottom to top management and boards. The greater the innovative capacity the individual develops – the more we can invent. When a human is expanding the brain’s capacity, it can create new growth without additional costs. When every individual in entire organizations – expands their brain capacity, that really transforms the prospects! This presentation provides mental tools that ensure AGILE iNNOVATION – flexible adaptation in and of the individual in any market and Trend. Understand why the brain “helps us” – when we have a clear focus projected into the Future. NEURO LEADERSHIP sustains agile innovation. Futurize yourself and your organisation. Riskwillingness is the prerequisite for innovation & futurization. Are you & your business - committed to improving the state of the world? DECENCY LEADERSHIP is for everyone who DARES, YOU who are creators of a future for the Greater Good of Humankind. To ALL – striving for a future worth living. TO LEADERS, who really WILL lead into the future. There is growing focus and demand for social responsibility, fair trade, sustainability in the utmost sense. We MUST navigate a matrix shift – towards decency in our approach to shaping business and societies. So, even though DECENCY LEADERSHIP perhaps initially sounds naive and long-term – it’s the recipe – that we will survive in the future. It’s also DECENCY – most employees are looking for in a leader in the long run…..
HUMANIZE WHEN WE FUTURIZE. We live in a technological stampeed – to utilize the 4 Industriel Revolution to the advantage of HUMANS, we must strengthen the individual to choose and not lose. HUMAN INNOVATION – LIKE NEVER BEFORE is for whole organizations, teams, any group of people who strive beyond STATUS QUO. This KEYNOTE is both a mental recipe for inventing towards the future we dream about. And the recipe for how we adapt to the rapidly changing era – without existential fear of what to expect. HUMAN AGILE INNOVATION. This presentation mobilize and support organizational transformation processes where ALL participation is a prerequisite for success. Requested WORLDWide as this KEYNOTE mobilizes renewed hope, self-responsibility and continuous fighting spirit. THE MOST IMPORTANT SKILL IN THE AGE OF AI - ARTIFICIAL INTELLIGENCE ? HUMAN INNOVATION! The prospects of I4.0 are that more will implement robots and AI-Artificial Intelligence – leading to a reduction in jobs that require repetitive tasks. Instead, the world will need more human creativity to innovate whatever it takes to comply with the Global Goals as the 4th Industrial Revolution unfolds its reality. Humans are able to imagine visions of the future – which we then bring to life through our agile innovations. How can we innovate transforming future visions and as individuals take co-responsibility to innovate a Global live-able future? How do we best challenge stiffling habits – expand agile human innovation, innovate leadership capabilities and dispel the inappropriate consequences of materialism’s repeated patterns – in an effort to innovate a paradigm shift – towards DECENCY LEADERSHIP & HUMAN INNOVATION. HUMAN INNOVATION & DECENCY LEADERSHIP are simple solutions to the complex challenges to contribute to the 17 Global Sustainability Goals. We must ensure that the fourth industrial revolution unfolds with humanity at its core. Because Global Stability based on human innovation – is the only strategy for long-term Global sustainable success. Innovate personally, individually, locally – transform globally. Most individuals want to dedicate themselves to a mission that makes a difference in the world. Commit to improve the state of the world through innovating your personal mission for expansion into I4.0 in compliance with the 17 Global Goals. Connectivity due to the technological revolution will expand what humans truly value.